I have four Whole Foods Markets semi-close to my house, but all are pretty much exactly 20 minutes away. Sometimes it seems like everything in the world is 20 minutes away from my house. Give me any location to plug into GoogleMaps and I almost guarantee it will be 20 minutes away from myhouse. I know that’s nothing to really complain about and 20 minutes is relatively close, but sometimes I just want to “run” to Whole Foods and not make a whole afternoon of it. Also lucky for me is that my “regular” grocery store is a mere two minute drive (in traffic) and I’m able to stop there throughout the week if I forget something or they’re out of stock during my regular trip. I’m also lucky in that I have a Whole Foods near my office… About a 12 minute walk away. When the weather is nice (though if you’re in the Boston-area like me, that phrase probably sounds foreign to you since the weather has not been nice here in about two weeks) and I have a little open time in my work schedule (another rarity), I’ll sometimes put on my walking shoes and trek over to Whole Foods. Once there, I pretty much just roam around and throw anything into my cart that looks fun and fresh and can’t be found in my regular store. Last week, I thought I might be in heaven when I saw fiddleheads and beautiful heirloom carrots (I also got purple potatoes, which will show up in a post coming up soon). I threw some haricot vert into my cart, as well, and decided to keep it fairly simple with my newly found produce. While roasting isn’t a super spring-like activity, the weather we’ve been experiencing hasn’t exactly been springlike and I feel that you can never go wrong with roasted vegetables. Once I took the vegetables out of the oven, I arranged them on a plate and sprinkled a little feta cheese and fresh parsley on top. Keeping it simple and heavenly. This was my first time preparing fiddleheads at home and if I have it my way, it won’t be my last. If you’ve never had them before, I’d describe them as being a little bit earthy and rich, with a bit of the bitterness of asparagus. And absolutely delicious. The feta cheese does a really good job of balancing out the flavor. I realized that I have a serious lack of side dishes on my blog and that I’m just not a good side dish planner. I spend lots of time planning my weekly meals, but often feel stuck when it comes to what to serve on the side and find myself just serving plain old broccoli or asparagus or a kale smoothie. I need more sides like this in my life! However, I’d probably even eat this side dish for dinner. With a side of pita chips and hummus. In fact, that’s pretty much my ideal meal. And what I like to call a very healthy balance. Try it, my friends! Other items I always pick up on my random jaunts to Whole Foods? A bottle or two of kombucha, Pumpkin and Spice Siggi’s Yogurt, and a pack of frozen acai. 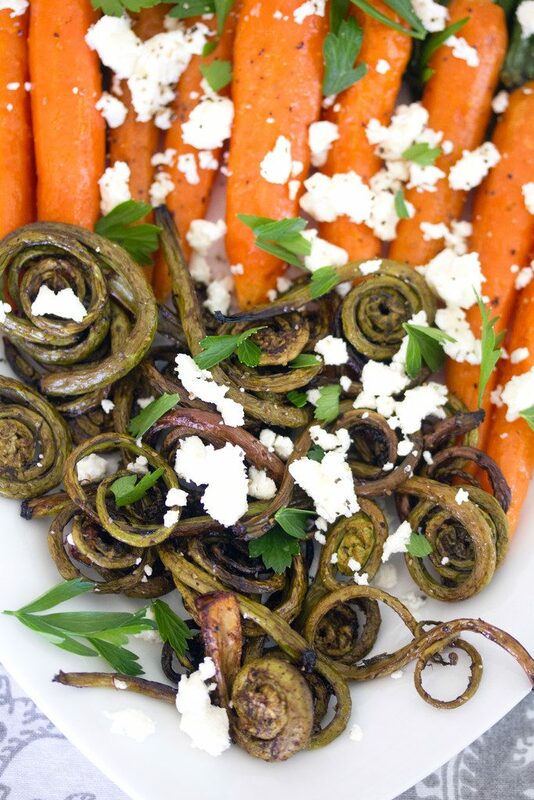 Have you cooked with fiddleheads before? 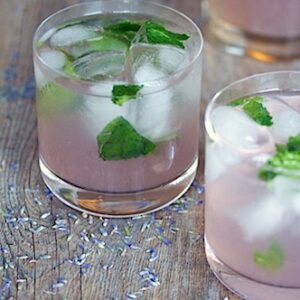 It's time to get fancy with your vegetables! 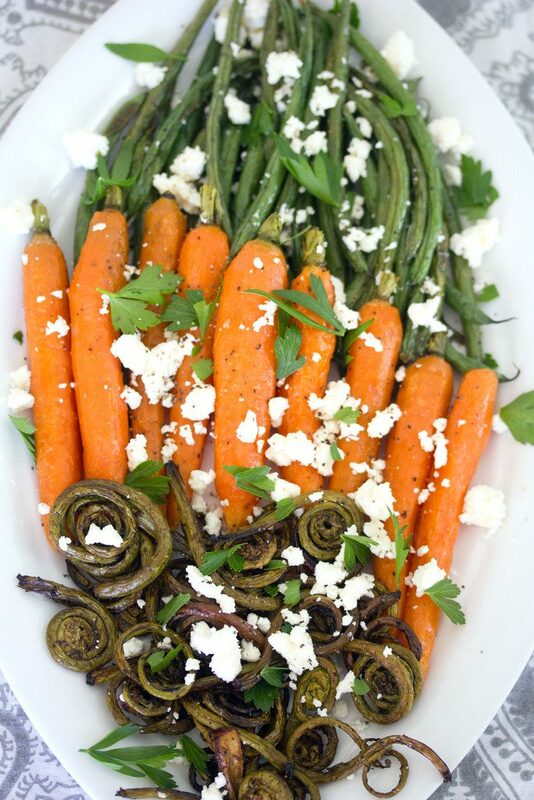 This side dish combines roasted fiddleheads, heirloom carrots, and haricot vert with feta cheese and fresh parsley. 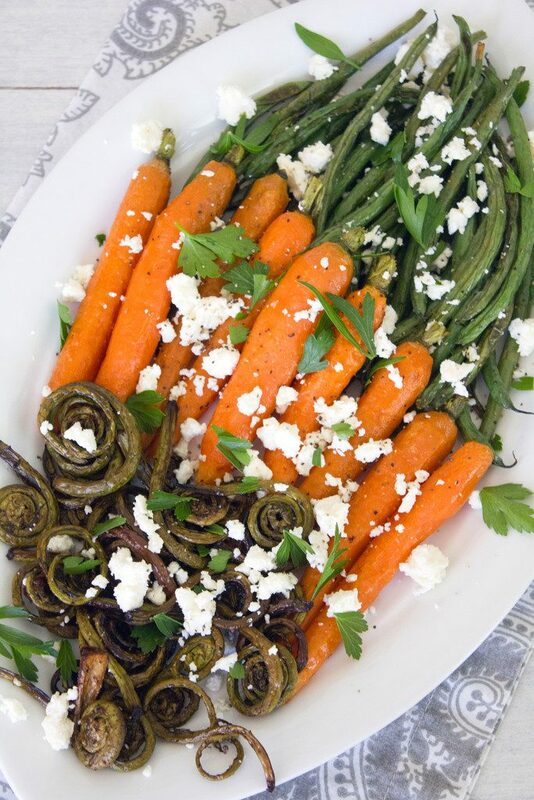 Combine fiddleheads with 1/2 Tbsp. olive oil and salt and pepper and place on parchment paper covered baking sheet. 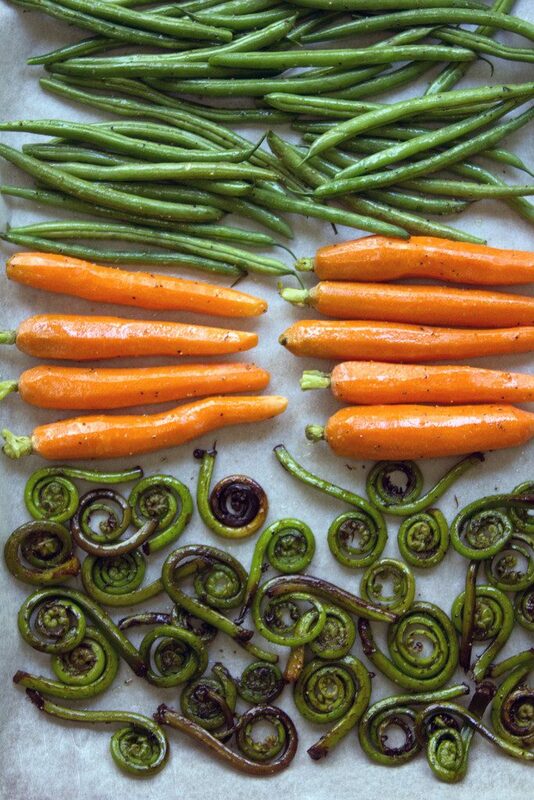 Combine heirloom carrots with 1 Tbsp olive oil and salt and pepper and place next to fiddleheads on baking sheet. 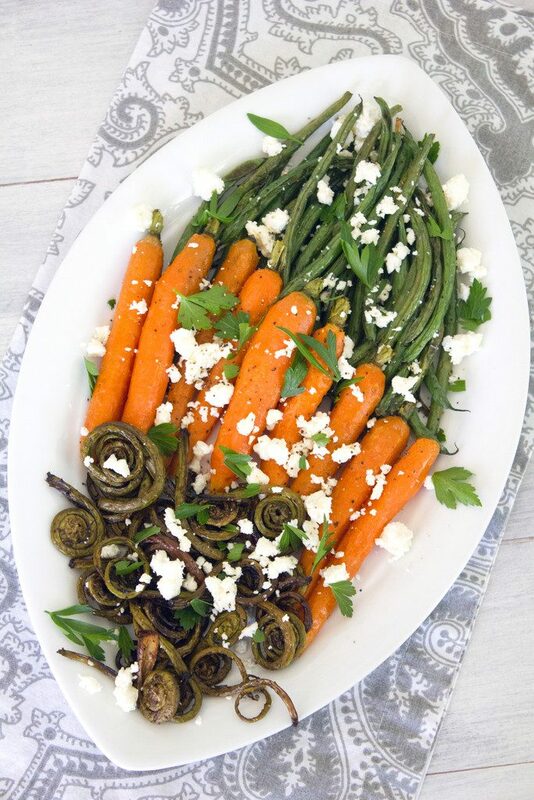 Combine haricot vert with 1 Tbsp olive oil and salt and pepper and place next to carrots on baking sheet. Roast vegetables at 400 degrees for about 20-25 minutes, until lightly browned. 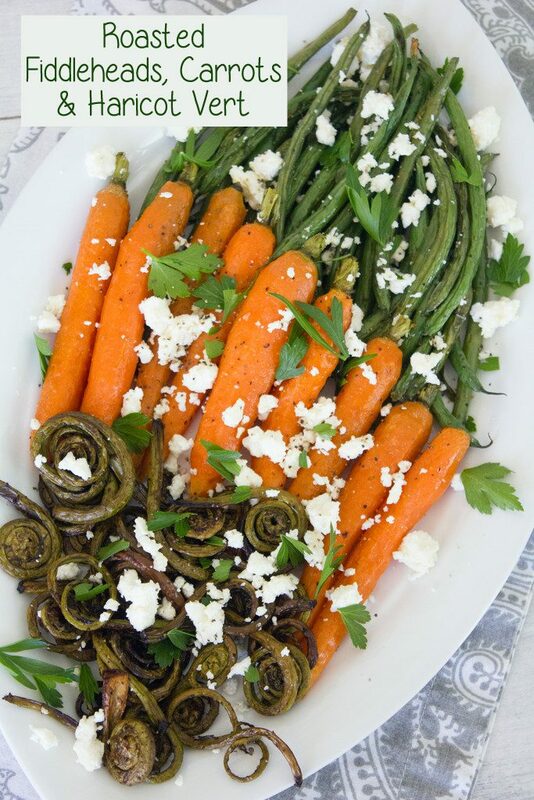 Arrange vegetables on a platter and top with crumbled feta cheese and parsley. 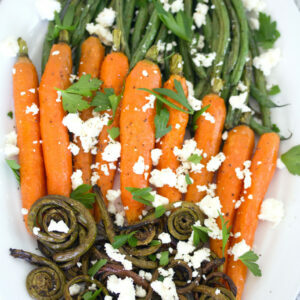 9 Responses to "Roasted Fiddleheads, Carrots, and Haricot Vert"
Such a beautiful display of “Spring”..so simple & pure! I love fiddleheads!! 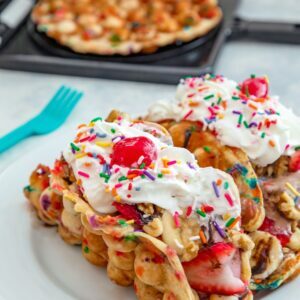 This sounds like the perfect Spring meal! I’ve still never tried fiddleheads. 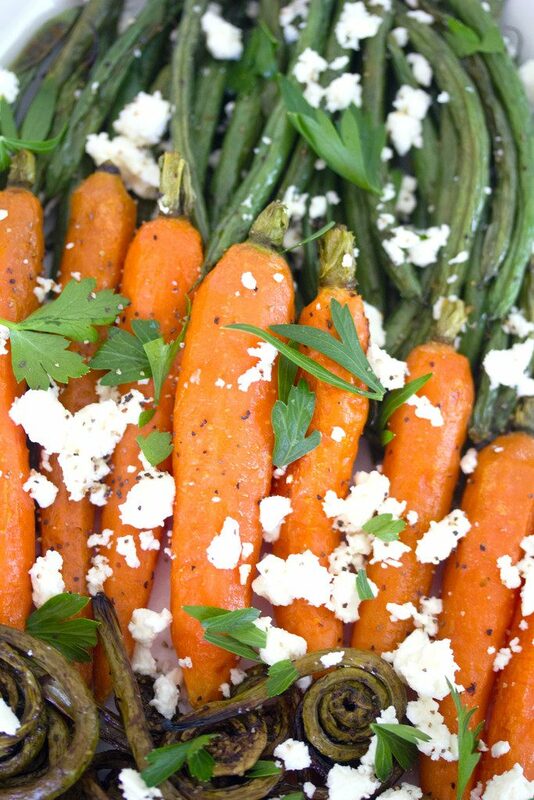 The combination of veggies topped with feta looks delicious. I am so with you – I always plan the entree, but almost always end up making broccolini or asparagus or something easy for a side dish. 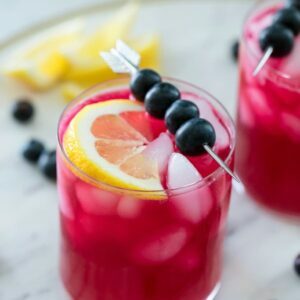 This looks simple, yet so elegant and delicious! I’ll have to make it soon, before all of the fiddleheads are gone. Such a beautiful side dish! I’ve never tried fiddleheads before but love a good Whole Foods trip! Fiddleheads! I have been on the look out for those guys for awhile now, but have yet to find them. 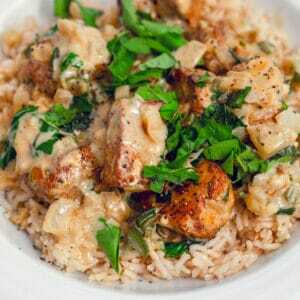 This side dish looks so healthy and delicious. I love the colors here and now craving some roasted veggies too. I always grab some vanilla Siggi’s when I’m at Whole Foods too. This looks so awesome! I have never had fiddleheads before, but I have seen them used on Chopped (love that show). Now I want to try them out!! Pinned :).